It's late in the day, but I have been celebrating all day long! 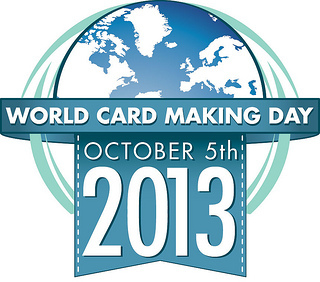 Happy World Card Making Day to all of you! Unfortunately the image doesn't photograph very well behind the acetate. I colored the background with Distress Inks (Peacock Feathers and Chipped Sapphire) and embossed the stamps in white. The stamps are "JOY" from Lawn Fawn's "Peace, Love, Joy" set. I also heat embossed the holiday lights on the card. The paper is Dear Lizzy "Lucky Charm". It reminded me of a soft snow drift, so on to the card it went! I used mini pink sequins and larger white and clear sequins inside the shaker. Back to creating. Join me tomorrow for some Halloween fun and tons of other crafty ladies! Beautiful card! I really love the idea of putting sequins in a shaker card. Looks great! beautiful! i love the soft blue window...the red sequins just pop!